My all-time favorite actor was born Marion Mitchell Morrison on May 26, 1907 in Winterset, Iowa. But John Wayne the movie star was born in 1930 when, after years of bit parts, he landed the lead role in Raoul Walsh’s THE BIG TRAIL. The movie flopped at the box office, but it got Wayne noticed. After scuffling along in low-budget, juvenile B-Westerns for most of the 30’s, Wayne was cast as The Ringo Kid in John Ford’s blockbuster STAGECOACH , and his career took off like a wild stallion. 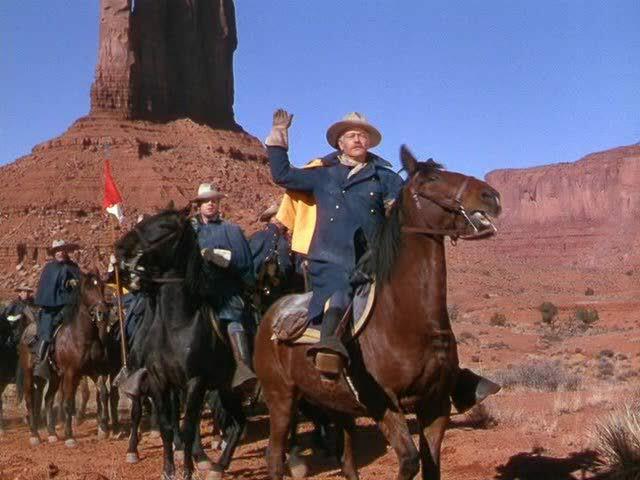 “The Duke” (a nickname he picked up as a kid) was an A-Lister now, the biggest star at Republic Pictures. Wayne and Ford continued their film collaborations throughout the 40’s. 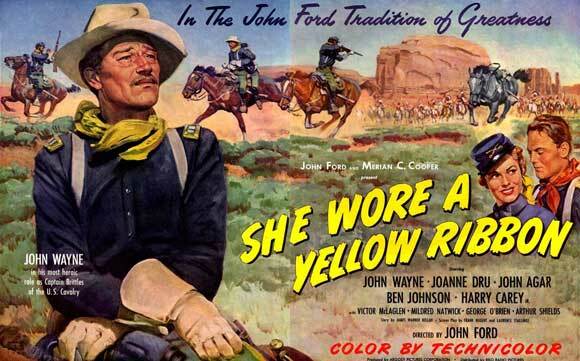 At the end of the decade RKO released the second of the Wayne/Ford “Cavalry Trilogy”, SHE WORE A YELLOW RIBBON. The film was a smash hit, a rousing adventure bolstered by Wayne’s portrayal of a man twenty years older than himself, Captain Nathan Brittles. Nathan Brittles is a by-the-book horse soldier who rose through the ranks to make captain. He lives by his choices, his code summed up in his favorite saying: “Never apologize, it’s a sign of weakness”. His practical, no-nonsense manner make Nathan a well-respected cavalry officer, but mask his softer side. Nathan Brittles is a true sentimentalist, making nightly visits to speak with his deceased wife at her gravesite. He’s loyal to his men, especially his Irish Top Sergeant Quincannon, who has a penchant for the bottle. And his gruff demeanor with Lieutenants Cohill and Pinnette are designed to bring out the best in them. Nathan Brittles is a completely different performance from Wayne’s other two 1949 roles (John Breen in THE FIGHTING KENTUCKIAN and Sgt. 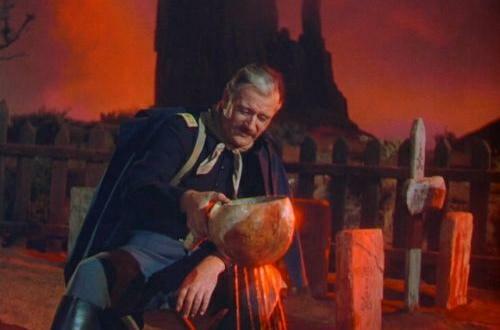 Stryker in SANDS OF IWO JIMA), and The Duke proves once again he’s not only a “star”, but a fine actor. Nathan’s just six days away from retirement, eager to ride west to the untamed California territory. 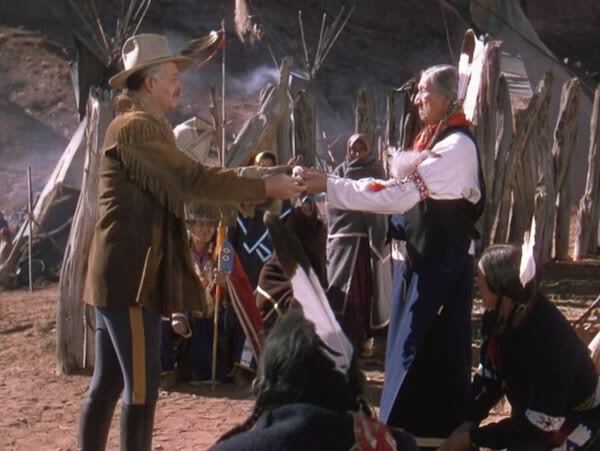 His superior officer Major Allshard gives him one last assignment: a final patrol to talk peace with the Cheyenne and Arapaho tribes, who’ve left the reservation to band together with renegades seeking to wage war with the whites after The Battle of Little Big Horn. But there’s a catch, as the Major wants Nathan to take his wife and young niece Olivia along, sending them away from the potential threat of war. Nathan protests (in writing, according to protocol), but reluctantly leads the troop through hostile territory, assisted by his lieutenants Cohill and Pinette, both of whom are vying for Olivia’s affections. They’re to drop the ladies at the stagecoach station on the way. However, advance scout Sgt. Tyree discovers a horrific tableau, and Nathan and his men ride out to discover the station burned, the man and woman who run it dead, their children left orphans. Now Nathan must take these children along and return to Fort Starke, his mission a failure. Nathan has four hours remaining before his time with the Cavalry is up, so he rides with Tyree straight into enemy camp. He has a powwow with Chief Pony-That-Walks, hoping to avoid the potential bloodshed. The two old warhorses believe that “old men should stop wars”. Pony-That-Walks agrees, but believes it’s “too late, young men don’t listen…many will die”. Having failed, Nathan and his men devise a nighttime raid that scatters the Indian’s horses, thus leaving them on foot. The Indians, having lost face, must now walk back to their reservations, and the war has been averted. Nathan Brittles, “ex-Captain of Cavalry USA”, now heads west to California, “towards the setting sun, the end of the trail for all old men”. Suddenly, Tyree rides up on him with news from the war department… Nathan has been made Chief of Scouts, and given the rank of Lt. Colonel by his contacts in Washington (including President Ulysses S. Grant!). Nathan and Tyree return to Fort Starke, where a dance is being held in his honor. 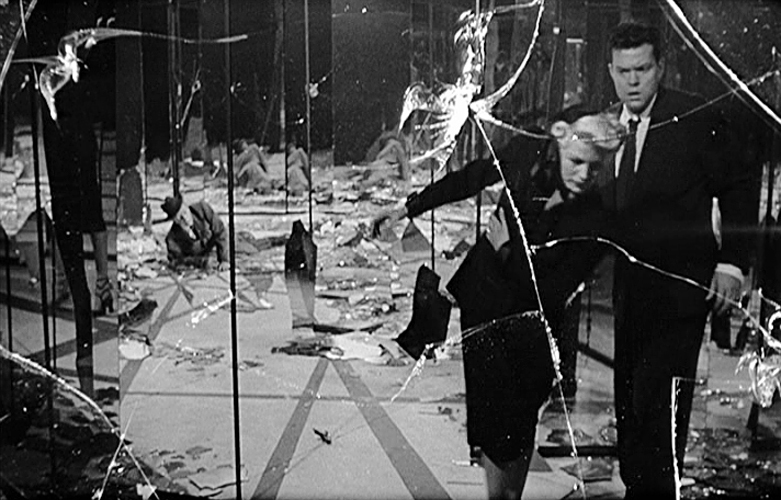 But first, he excuses himself, returning once again to his wife’s grave to give her the good news. John Ford surrounds Wayne with a solid supporting cast. John Agar and Harry Carey Jr. play the rival Lieutenants, with Joanne Dru (Wayne’s RED RIVER costar) as the object of their affections. 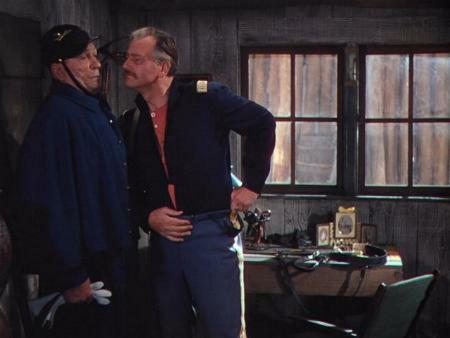 Victor McLaglen (Quincannon) is the comic relief, and almost steals the picture. George O’Brien (Major Allshard) was a silent star thanks to Ford’s 1924 THE IRON HORSE and F.W.Murnau’s classic SUNRISE, and later made a series of B-Westerns. Ben Johnson (Tyree) was a champion rodeo rider and stuntman, a favorite of both Ford and his spiritual heir Sam Peckinpah. Johnson won a supporting actor Oscar for 1971’s THE LAST PICTURE SHOW. Other Ford favorites here are Mildred Natwick, Arthur Shields (brother of Barry Fitzgerald), Ford’s own brother Francis, Chief John Big Tree, Noble Johnson, Tom Tyler, and Paul Fix. Actor/director Irving Pichel narrates the tale. 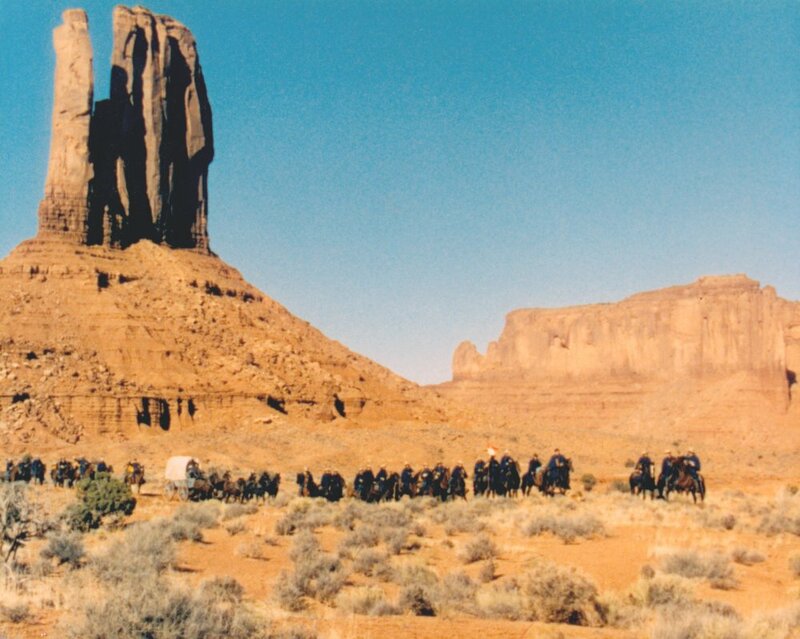 John Wayne’s main costar is once again Monument Valley, Ford’s favorite shooting spot. Its rugged terrain forms the perfect background for Nathan’s rugged individualism, and Winton Hoch Technicolor cinematography won the Oscar for his breathtaking filming of the beautiful scenery. Hoch had honed his skills as cameraman on the James A. Fitzpatrick TRAVELTALKS shorts, and was awarded the Oscar on four separate occasions. 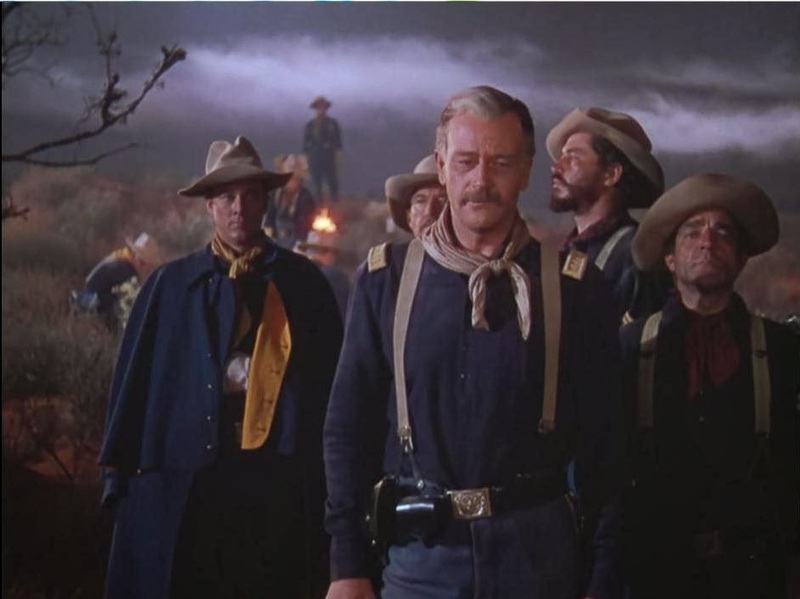 SHE WORE A YELLOW RIBBON is the best of the Ford/Wayne “Cavalry” films, a colorful, grand entertainment that provides another acting showcase for John Wayne. So here’s to The Duke on his 109th birthday anniversary, continuing to bring the American West to vibrant life in films like this one. And remember, “Never apologize, it’s a sign of weakness”! One of my favorites of John Wayne and a great movie to start the Memorial Day weekend off. Yes, you can’t beat The Duke! Ah, The Duke! He was fantastic, and one of my favorites. I’m not really into Western’s as such, but any movie he was in I loved. To me, he and Clint Eastwood Westerns were/are the best.